This is a first for me. In terms of NaNoWriMo. I have changed books. "The Ring of the Dominoes" will be written; it will. Just not this November. Unless this new one falls flat or fails and I don't think it will but you never know. "The Ring of the Dominoes" is still valid - but this new one has called me and I am going for it. No. No details. Not now. I don't know what my updates will look like as I move forward. But my new NaNoNovel is "Write from the Body" - which isn't what it seems from the title but I'm leaving it as is because I need to write it. I will probably not write the 1800 words needed to get caught up to the daily average tonight. That's okay. I have some writing time tomorrow between observing and giving feedback to an interpreting team on a rehearsal tomorrow morning and then observing just for support and entertainment another play's interpreted performance tomorrow night. So maybe I will be behind tomorrow, too. Because I also have to do some practice and preparation on the play I'm interpreting Friday night. But soon. I will catch up. And if I don't, then I at least have my annual coast writing retreat later. 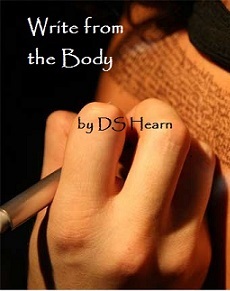 Okay, on to "Write from the Body." My new NaNoBook. Oh! And I found an email I sent to myself on Nov 8th with two sentences for the novel. So I haven't had a zero day, yet. Yay. Near zero - yes, two of them. Whew. I thought I'd done something.